The Lodge Report is back. Blue Damsel Lodge has had a few changes this year and one thing is staying exactly the same. The new General Managers are Rob Woodruff and Jenny Mayrell-Woodruff. They are both Orvis Endorsed Fly Fishing Guides with long careers guiding in Northeast Texas and Southeast Oklahoma. 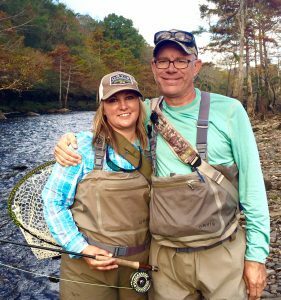 Jenny was just awarded the title of 2018 Orvis Endorsed Freshwater Guide of the Year. Congratulations to Jenny and all of the 2018 Orvis Endorsed Award winners! But, former Blue Damsel Manager Keith Radabaugh is taking on the title of Manager Emeritus and will still be at the lodge the majority of the time to help guests have the best trip possible. The new Chef is Tim Gardner. He has worked under Chefs Emeril Lagasse in New Orleans and Tabb Singleton (who won “Chopped” on the Food Network in 2013) in New Orleans and Broken Bow, Oklahoma. He is looking forward to combining his background in New Orleans and New Southern cuisine with everything western Montana has to offer. The lodge opens June 4, so come see what is new and what is not. This entry was posted on Wednesday, April 25th, 2018 at 8:32 pm and is filed under Lodge News. You can follow any responses to this entry through the RSS 2.0 feed. Both comments and pings are currently closed.